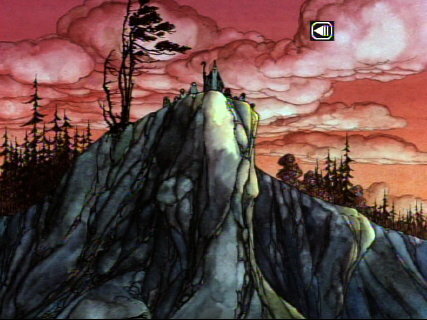 After Peter Jackson’s Lord of the Rings trilogy, this seventies animated special became a lot more quaint, almost a guilty pleasure. But as much as I’m looking forward to the LoTR prequel from Jackson and del Toro, I still find it very enjoyable. Before it was available on DVD I made it a ritual to watch it on VHS once a year when visiting my parents. This might be the first movie I’d seen where I’d also read the book. It gets the feel of the book down very well, even with the singing. The book had singing, too. I’ve owned this DVD for years, and never noticed until now that the back of the DVD describes this as “In this enchanting adaptation of the first installment of J.R.R. Tolkien’s classic The Lord of the Rings trilogy, Bilbo…” Of course, this is the Hobbit, not the first installment of The Lord of the Rings. It was and is its own story. It’s taken me so long to review this, however, that that version isn’t available. Perhaps the new version says “all four installments of the trilogy”. The art of the movie is much better than the art on the DVD packaging. It’s more similar to Tolkien’s drawings than to that weird glowy squirrelly thing on the cover. Take a look at the frames in this review: it’s a beautiful translation of not just Tolkien’s story, but his artistic style. There is unfortunately a very big problem with this DVD. 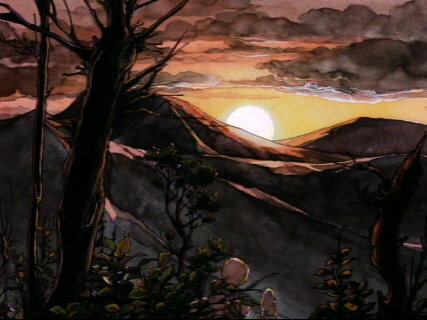 When first watching it, I noticed that though the animation is as beautiful as ever, the movie doesn’t have the same impact as it used to. At first I attributed it to the movie itself just not being as good as I remembered it being, but though that’s often true (see Scooby Doo for a good example), it didn’t seem right here. For one thing, I’d just watched it in the last year, on VHS, and loved it. There was something missing from the experience. I realized what it was one day when in the scene where the dwarves are carrying on with Bilbo’s plates and cups. There were no sound effects. One of the things I remembered vividly from my childhood were the clinks and clatterings of the plates in that scene. What happened? Did I just imagine them? No, as it turns out, many of the sound effects, and even some of the dialogue, has been removed from this version. And it isn’t just the plates and cups. Smaug has lost his roar, his armor has lost its hardness, and the dwarves have lost their nerve. After all that, complaining about auto-start is pointless. But it does; if you put the movie in and then go to get some popcorn ready or hit the bathroom, you’re likely to come back and find the movie already running. And of course, this being the seventies, they made up their own songs, too, such as “The Greatest Adventure” sung by Glenn Yarbrough. As silly as it is, it was still inspiring to me as a kid. Of the voices, all are well done, although Bard’s voice is perhaps a bit jarring. He’s voiced by the great John Stephenson, but using one of his standard cartoon adventure hero voices. He sounds like someone from Johnny Quest. There are only two real flaws with the movie. The first is that the enemies need to be ugly. You won’t recognize the race of Legolas in these goblin-like elves with German accents and lavender skin. I have no desire to see the later Rankin-Bass “Return of the King”, but I do have to wonder how they drew Legolas in that version. The second is that it is completely anti-war, even to the point of being against defensive wars. In the book, Bilbo clearly and loudly opposes the Dwarves going to war against Laketown and the Elves. He even clumsily tried to engineer a peace between the factions, and almost succeeded. When the goblins attack, however, he does not, as in the movie, view it as just another faction. While he does withdraw from sight he does not withdraw from battle. When the battle looks lost, he keeps retreat in mind but still stands among the Elves “to defend the Elvenking”. He has no need to pretend to have been knocked out in the fight: he is knocked out, by an errant rock dropped by the eagles. When the eagles come to join the battle, Bilbo, in the book, is overjoyed to see them, yelling and dancing and waving his arms. It’s one thing to be against a war between friends; but when your friends are dying and someone comes to save them? That’s not the time to be disappointed. He certainly didn’t feign unconsciousness in the book. He was hit by friendly fire, when an Eagle dropped a rock on him. His invisibility almost killed him, because when injured no one saw him; he lay on the field of battle unconscious through the cold and damp night. Tolkien was talking about the cultural West (if he was making any allusions at all other than to direction). I wonder if the scriptwriter removed “and song” in a vain attempt not to evoke the summer of love? This is a fine movie. Unfortunately, the DVD is not. It has extremely poor sound: it’s missing sound effects as well as some dialogue. I’d wait unless you absolutely need it now. 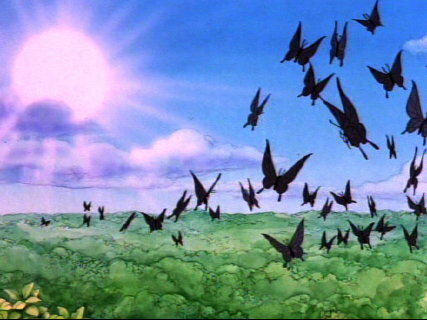 From the flapping wings of the tiny thrush to the screams of the great Smaug, too many important sounds are gone. Even the dialogue is affected. We hear Bilbo tell the barrels to “stop complaining” but we don’t hear the dwarves in the barrels complain in the first place! The movie underscored the ineffectiveness of arrows against Smaug by having them plink against his skin and fall away. Not so on the DVD: they silently do whatever they do. Even the clinking of plates goes away. It adds a rushed, hurried effect to the scenes. It drastically changes the pacing and the ambiance. The same care went into the special features. The special features on this DVD, like Hobbits, are small and insignificant. Unlike Hobbits they don’t rise to the occasion. The cast and crew listing is no more than a listing of who did the major voices. There are four screens of minor trivia about Tolkien and Hobbits. As much as I love the movie, there’s no way I can recommend this DVD. Unless you want it for the art’s sake—which is entirely possible—it’s missing too much of the original. Don’t even try showing this to someone who’s never seen it before. Without the sound effects and dialogue of the original, it’s going to come across as cheap and lost. Update (October 10, 2009): I have personally verified that many sound effects are lost from the VHS version. Dwarves pick silently in the mountains; dragons do not roar; swords no longer swish; and explosions are colored lights and nothing more. Very disappointing. If you enjoy animation, you might also be interested in Heavy Metal, How the Grinch Stole Christmas, Scooby Doo’s Original Mysteries, The Complete Superman Collection, Underdog, Wallace & Gromit, and Yellow Submarine. If you enjoy fantasy, you might also be interested in Excalibur, Highlander, Ladyhawke, Pan’s Labyrinth, A Princess of Mars, Mistress of Mistresses, A Fish Dinner in Memison, The Hobbit and The Lord of the Rings, and The Worm Ouroboros. If you enjoy J. R. R. Tolkien, you might also be interested in The Hobbit and The Lord of the Rings. This apparently includes all three animated versions of Tolkien’s works, from completely different styles. Unfortunately, at least one of the transfers—for the Hobbit—is really, really bad. It’s missing sound effects and some dialogue. I know it has been years since you wrote this article, but since it is linked on wikipedia I thought it might be useful to provide further comment. The Warner Brothers Family Entertainment VHS version is also missing sounds effects. This version has a dark blue box, with a picture of Gandalf standing behind Bilbo, and Bilbo standing on a pile of treasure. The back of the box incorrectly refers to the Hobbit as the first installment of the Lord of the Rings trilogy. But I see there are other VHS versions out there, and it must be one of those other (better) soundtracks you remember from your youth. Thanks for the update. That’s too bad. Update: I’d hope the rights owners would use the new Hobbit movie as an excuse to come out with a good version of this Hobbit movie. It doesn’t sound like it, though. Got a hold of the 1991 VHS version from Warner Family Classic. Box cover is a light yellow, with Bilbo standing outside his door, pipe in hand. 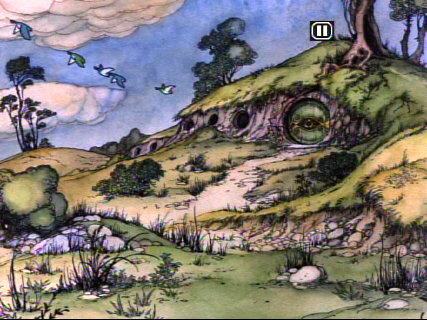 Gandalf is shown in a smaller circle frame to the upper right, and dwarves lined up below the Bilbo image. This version has the incidental sounds you wrote about, and you are right, it does make a difference! Obviously the thing to do is to get both versions and digitize the VHS audio then combine it with the remastered DVD picture. Ideally this would be done with a VHS tape with good audio and a lossless conversion process. Someone did that very thing over ten years ago. Look for "The hi-fi Hobbit". Thanks for the heads-up. The hi-fi hobbit is great. It really brings the joy back into watching this old cartoon! The Hobbit last modified August 22nd, 2015.